The town of Nuwara Eliya is well deserving of its nickname, 'Little England'. Discovered by British explorer John Davy and officially founded by Samuel Baker in the 19th century, Nuwara Eliya became a haven for expats seeking a taste of Blighty in sweltering Sri Lanka. Hunting, cricket and polo were commonly enjoyed by residents and the moderate climate was a welcome contrast to the often steamy temperatures experienced elsewhere in Sri Lanka. Over time, the British settlers transformed Nuwara Eliya into a colonial haven and built era-appropriate buildings. From perfectly manicured gardens, to tudor-style houses and tourist lodging, plenty of structures constructed over a century ago are still standing and give the town its quaint, nostalgic feel. The drive to Nuwara Eliya is extremely scenic, due to its location 1868m above sea level. Watch the road weave around mountains and fields, thanks to the region’s rainy, subtropical climate. As you approach town, you’ll have panoramic views of the surrounding tea plantations and pops of contrasting colour from those working the fields. While the region is best known for its thriving tea plantations, coffee was the original plant grown here. Soon after the British settled in town, they set up coffee crops in addition to plantations with typical European vegetables like broccoli. One hundred years later, Nuwara Eliya is still Sri Lanka’s most fruitful producer and distributor of European vegetables. However, the coffee plantations were wiped out in the late 19th century due to the country-wide coffee blight. The coffee was replaced with tea plantations and just a few years later, the region had transformed into the tea capital of the Sri Lanka, a title it still holds. A trip to Nuwara Eliya, naturally, is not complete without visiting a tea plantation. Learn about all stages of the tea-making process, from the initial planting, through to the drying and packaging. The women of the region still handpick every tea leaf, their nimble fingers can sift through the leaves more efficiently than any machine currently on the market. After touring the lush rolling terraces, indulge in some locally grown brews - Nuwara produces all kinds of tea, but its delicate Ceylon is world-renowned. 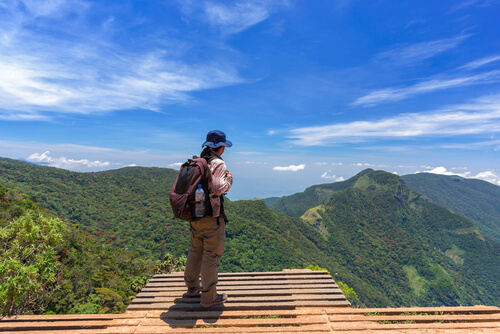 A short drive outside of Nuwara Eliya will bring you to one of the most scenic spots in all of Sri Lanka: Horton Plains. Known as a ‘super biodiversity hotspot’, thanks to the large wildlife population, Horton Plains is a highland plateau with a rapidly changing climate. To best experience the plains, follow the central path, keeping your eyes peeled for deer and other animals. Eventually, the winding trail will bring you to World’s End, a viewpoint that offers stunning views of the rolling hills. Just be sure to arrive before 10am, as the area tends to cloud over by mid-morning.